Periodontitis is characterized by a gum infection which destroys the soft tissue as well as the bone supporting your teeth. This dental condition can lead to tooth loss or even worse, a greater risk for developing heart attack or stroke or certain other serious medical conditions. Although, periodontitis is common but it can be easily prevented. 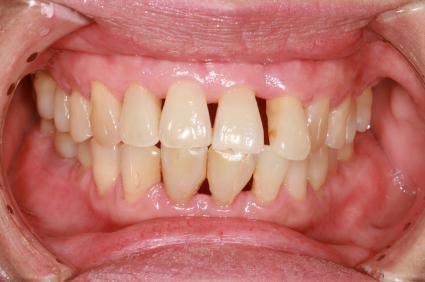 Periodontitis usually occurs from a poor dental hygiene. Brushing and Flossing your teeth every day and regular dental cleanings can reduce your risk of developing this condition. Periodontitis typically begins with plaque, which is composed of bacteria. Plaque builds up on the teeth when sugars and starches in food interact with bacteria found in the mouth. Daily brushing and flossing can help remove plaque. If plaque stays on the teeth for more than 2-3 days, it can harden under the gum line into calculus (tartar). Due to the formation of tartar, plaque becomes very difficult to remove and promotes bacteria accumulation. You might require professional dental cleaning to get rid of tartar. Remember that the longer the tartar remains on the teeth, the more damage it can do to your overall health. Normally, gums are pale pink and firm. If your gums are dusky red, puffy or bleed easily, or you experience some of the other symptoms of this condition, consult an experienced dentist at Brighton Implant Clinic as soon as possible.